An ice cold drink in your hand. The Lowcountry sun shaded by your large brim hat. The smell of the fresh cut fields. The sound of the ponies galloping in the background. The excitement of the impending match. A myriad of food options surrounding you, along with an array of friends and neighbors. If this sounds like your idea of a good time, you don’t want to miss one of Bluffton’s premier social events of the fall. Polo for Charity, organized by the Rotary Club of Okatie, takes place Sunday, Oct. 11 at the lovely Rose Hill Equestrian Center in Bluffton. Gates open at noon with the match starting at 2 p.m.
With prizes awarded for the best hat and the best picnic, there is more to this event than just the competition between the polo players. You’ll want to put some thought into your spread and your attire. Some patrons attending the match choose to go with the traditional tailgate atmosphere: chairs, tables, finger foods and drinks. And basic is perfectly fine. However, others opt to take it up a notch with chandeliers, china, linen tablecloths and flower arrangements. One year, the winner of the “best picnic” had the look and feel of an entire living room, complete with a couch, area rug and cozy chairs. Generally the food and drinks enjoyed within the tents is where polo tailgating takes a sharp right turn from traditional tailgate cuisine. Yes, hot dogs and hamburgers are common. And don’t worry, a wide variety of chips and dips are served. The beer is just as cold as it might be in a parking lot outside of Williams-Brice Stadium. Those staples are not discouraged. In fact, they help make up what could only be described as eclectic Bluffton tailgating. In addition to traditional fares are more elegant and perhaps “dressed-up” food choices. Think fancy, yet portable and most certainly delicious. Plan for elegant but nothing that will melt in the October sun. When deciding what to wear to Polo for Charity, the theory of basing your outfit on what shoes you want to wear definitely makes sense. Many women opt for trendy high heels. This choice may look stylish, but those spiky heels don’t look as cute when they are sinking deep into the grass-lined polo field. You can make a fashion statement while still being sensible. Many opt for stylish yet comfortable shoes. Because while there are plenty of places to sit among the tailgate tents, most spectators are on the move. There are people to see, foods to sample and of course, the auction items to peruse. Not to mention, as part of the crowd, you are automatically in the halftime show. Don’t worry, you won’t be asked to sing or dance. But you can participate in the beloved tradition of divot-stomping. Women, whether you opt for the traditional sundress or maxi dress, bright colors abound on the sidelines of polo, and some choose to wear shorts or capris. Again, Lowcountry fashion is generally relaxed. Many gentlemen choose to don seersucker shorts or pants and festive bowties, while others break out the Hawaiian shirts and blazers. Just remember, October is still pretty warm in our area. So dress for comfort as well as style. And to top off your attire (perhaps the most important accessory), what’s a polo match without a fancy hat? Not only does it serve a practical purpose—the Lowcountry sun is always shining bright for Polo—but, you’ll want to participate in the annual hat competition. Both men and women are judged on the creativity and uniqueness of their head pieces. For women, that could mean a small fascinator or an over-sized straw hat adorned with a flower. Many men sport fedoras or Panama hats to join in the friendly competition. After taking the time to prepare your picnic and choose the perfect outfit, you might want to arrive early to set up and carefully arrange your tailgate spot. Heading out for a day on the polo field can take a bit of preparation to fully enjoy the experience. Or it can mean stepping off the boat with a cooler in your hand, sporting shorts and flip-flops. After all, this is Bluffton. Tickets are $20 at the gate on the day of the match or $15 per person in advance. Children under 12 are admitted free. 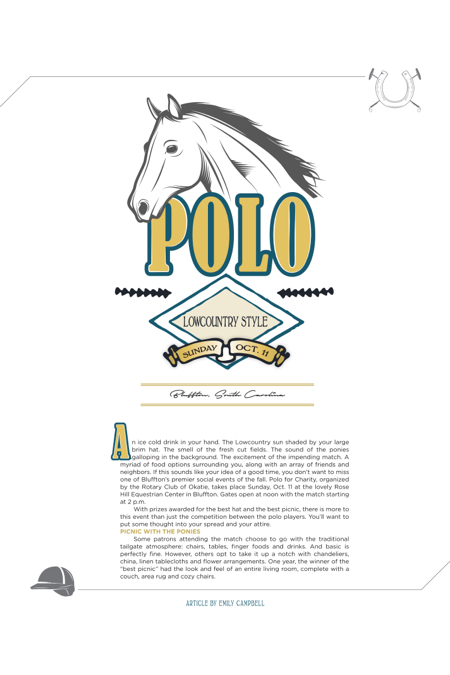 For information, contact rotarypolo@hotmail.com or call (843) 298-3055 or (843) 706-3760. Advance tickets will be available at BB&T bank locations, Markel’s, Coastal Home, Heritage Library Hilton Head Island and Atelier on Bay in Beaufort. Be sure to “like” Okatie Rotary Polo for Charity on Facebook to get all the details on this year’s event. Proceeds will benefit two important local charities: Family Promise and Moss Creek Marines.